If you are kicking off your first BRMS project, don’t start by gathering the rules! Often teams will be advised to begin their business rules project by gathering all the relevant rules, in a natural language or rulebook approach. But these rules-first approaches address issues that don’t exist with modern BRMS technology, resulting in redundant and counter-productive efforts. 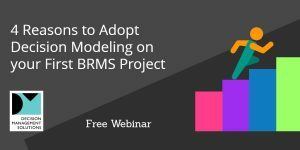 In this live webinar, James Taylor, CEO of Decision Management Solutions will detail 4 key reasons to start with decision modeling on your first BRMS project. The webinar has taken place, view the recording here.